Find out all you need to know about getting started with cycling with My First Cycling Book! All the basics are covered from choosing which bicycle is right for you to all the equipment and clothes you'll need to be comfortable and stay safe. You'll learn about looking after your bicycle and step by step instructions will guide you through to pumping up tyres, washing your bike and more. Then why not try some great science activities that will help you understand your bike? There are also ideas for fun ways to decorate your bicycle - use the sheet of stickers that come with this book or make your own handlebar steamers and wheel rattles! 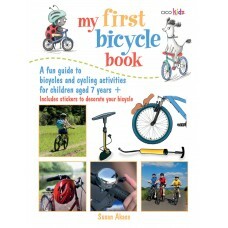 This is the perfect gift for first time cyclists everywhere!